The musical virtuosity, intensely artistic drive, and romantic spirit of violinists Alexandra Kazovsky and Gershon Gerchikov, violist Jan Grüning, and cellist Amit Even-Tov, the musicians comprising the Ariel Quartet, is the impetus behind their debut recording on Avie Records (AV2384; available March 16, 2018). “For this record we have decided to pair two giants of the string-quartet world, arguably the two major successors of Beethoven in this genre: Béla Bartók and Johannes Brahms. Both composers stand as significant pillars on our two-decade-long journey as a quartet, and pairing them here has been an emotional and rewarding process,” states the Ariel. A video of the Ariel Quartet performing Brahms String Quartet No. 2, Op. 51/2, I. Allegro non troppo, can be viewed here. The Quartet was recently awarded the prestigious Cleveland Quartet Award and has served as the Faculty Quartet-in-Residence at the University of Cincinnati’s College-Conservatory of Music (CCM) since 2012, where its members direct the chamber music program for strings and perform their own annual concert series. Recent seasons featured their sold-out debut at Carnegie Hall, and have included multiple Beethoven-cycle performances in the U.S. and Europe as well as frequent collaborations with artists such as Alisa Weilerstein, Jeremy Denk, and Menahem Pressler. Additionally, the Ariel was quartet-in-residence for the Steans Music Institute at the Ravinia Festival, the Yellow Barn Music Festival, and for the Perlman Music Program, and was the Ernst Stiefel String Quartet-In-Residence at the Caramoor Festival. The Ariel Quartet has been mentored extensively by Itzhak Perlman, Paul Katz, Donald Weilerstein, Miriam Fried, and Kim Kashkashian, among others, and spent a pivotal year in Basel, Switzerland, for in-depth studies with Walter Levin, the founding first violinist of the LaSalle Quartet. 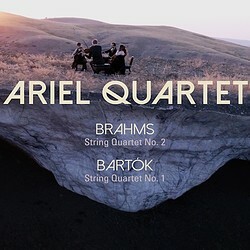 The Ariel has won numerous international prizes including the Cleveland Quartet Award, the First Prize at the International Competition Franz Schubert and Modern Music, the Grand Prize at the Fischoff National Chamber Music Competition, and the overall Third Prize at the Banff International String Quartet Competition as well as the Székely Prize for their performance of Bartók.